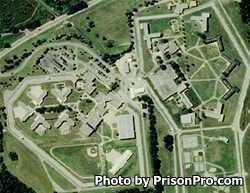 Richard A. Handlon Correctional Facility is located in Ionia Michigan. It is a level II facility that can house 1,295 adult male inmates. This prison gets its name from the first warden of the facility. Inmates are secured by two fences with razor wire, an electronic detection system, and a perimeter patrol. All inmates are given on-site dental and medical treatment. Counseling is also available for violence reduction, and to help change an inmate's destructive behavior. Richard A. Handlon Correctional Facility places a large emphasis on educating inmates while they are incarcerated, as studies have shown that inmates who have a GED, or learn a new vocational skill have a better chance of successful reintegration with society. Inmates can not only earn a GED but get an adult basic education.